A lifetime ago, I wanted to be Emma Peel. Oh how I longed for her looks, her London lifestyle, stylish wardrobe, surreal adventures, and cool cat-suit; I envied the way the roads she drove around were always empty, and resented that my idol also had a PhD in physics (and, yeah, her relationship with Steed). In this, a completely different life, I long to be quite a lot like Dame Diana Rigg. In London, I caught her solo presentation of material from her book “No Turn Unstoned” – an unoriginal title, although new and amusing to me. In ‘real life’, so many years after I first crushed over her high-kicking persona on the telly, I was delighted to be reminded of the pleasure of good performance in presentation. Dame Diana’s book has been described as scholarly, and indeed we were treated to some of the, now hilarious, bad performance reviews from classical Greece, and a subsequent exposition of the bad review in the theatre world throughout the centuries. But her storytelling technique is also enviable, pulling us into her world to the extent to which I currently refer to as ‘immersive’ – where unreality seems real. She did this with just her own voice and impersonations – reading from extracts and occasionally diverting, and enriching our attention with seemingly unscripted anecdotes. She is funny, as well as intelligent. Immersive storytelling, with a dash of humour, is a plausible format for the contemporary lecture. I learnt and retained, much of the narrative, in addition to running through ways in my head, in which I could incorporate aspects of her style into my own teaching repertoire. The bad note, is a criticism given to an actor by the director – the more famous actors never being given their ‘bad notes’ in public. A common cause of the ‘bad note’ is the desire of the actor to improve their part, and the director’s desire to remove the, often contentious, consequences from the characterisations. In my own rather modest time as an academic, I have noticed the advantages of performance skills creeping into my job. Lecturing (good lecturing) used to be about communicating concepts effectively; now it is about performing them. Today’s student cohort is drenched in high definition video and computer generated worlds, to say nothing of exposure to the torrent of celebrity lecturers with acting credentials, as well as a PhD in physics. A few bullet points thrown onto a white PowerPoint slide somehow doesn’t cut it anymore. This all leaves those of us with limited thespian backgrounds a bit adrift. We are judged continually on student satisfaction; via class feedback, module feedback, student-staff liaison committees, appraisal and peer-review. But the goalposts of satisfaction shift constantly, and in order to pass muster we need the resilience skills of performance, in addition to taking on-board new learning technologies, and methods of teaching and evaluation, alongside keeping up within our own areas of expertise. Teaching now centres around a strong element of immersive engagement; I, like many students, can be readily drawn in to any topic presented with enthusiasm and conviction, and higher education needs to address the need for academics to possess performance skills. With performance, however, comes the bad note. Where we were once judged on our academic ability, we are now also rated on our enthusiasm, and our ability to deliver satisfaction. We need to script not just slides and papers, but the whole show, from student lifestyle to learning outcomes. Whilst this may be no bad thing for learning and teaching in higher education, we have to learn to cope with the constant criticism; not all of us are famous enough to receive our bad notes in private, and often our attempts to improve our parts attract only derision. Diana Rigg read out some of her bad notes, and suggested that a way to get over them was to share them publicly, and with colleagues, thus removing their sting – and also reminding the authors of bad reviews that their words may be the subject of their subject’s next lecture. I joined a packed house at the Barbican last Friday, to listen to the words and voice of Neil Gaiman [@neilhimself]. The audience sat in rapture for several hours, listening as he read his stories out loud, and I was reminded that storytelling is not only a powerful art, it is a furiously popular one. 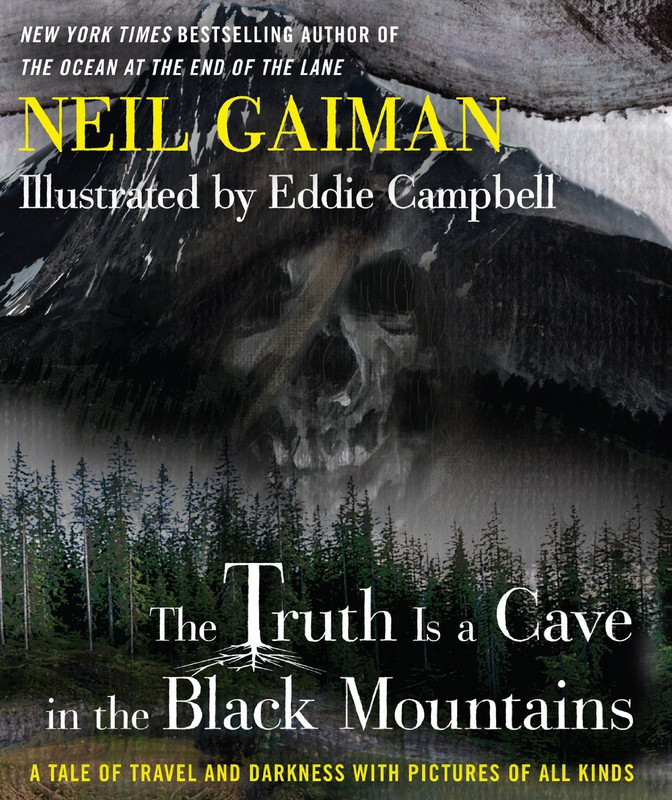 Gaiman’s darkish genre is not immediately appealing to me, but his performance, billed as ‘A revolutionary new concept of multi-media storytelling’, certainly was. The multi-media component of the evening comprised a blending of the author’s mellifluous narrative, with projected drawings by the artist Eddie Campbell, and the ethereal acoustics of string quartet FourPlay. This seems rather low key when we are bombarded with announcements of increasingly realistic virtual reality applications all day, but it was effective enough to draw me into the world inhabited by the characters within the story ‘The truth is a cave in the black mountains’. Good stories have always been immersive. Whilst the grading of a story as good or not is somewhat subjective, the aim of the writer is surely to draw the reader as close as possible to perceiving the tale as reality; to suspend disbelief, if only for a while. I often refer to JK Rowling’s Harry Potter series to illustrate what is meant by ‘immersive’, as many readers easily agree the world depicted in the mind solely by the text persuades the reader that Harry and his chums really exist. Artwork pushes this further, giving the reader something concrete to imagine. Many stories, have achieved this, possibly since the earliest narratives were written down. It is arguable that even earlier, oral documents, stories told by telling or singing, are an effective mechanism by which to deliver the feeling of immersion. The level of immersion offered by oral documents, or those consisting of text and drawings, is limited, however. The reader takes the role of a passive observer in the fictional world. The cinematic experience, film and video, provides a richer environment from which to fuel our feeling of immersion – but still we are unable to participate in any way. If we add contemporary interactive technology to multimedia’s sound and vision, we are granted permission to enter the unreal world and perform actions which influence the outcome. With video games for example, we are able to contribute in some way to the world loaded into computer memory. I have written previously, that the combination of pervasive networked computing, multi-sensory, rather than merely multimedia communication, plus participatory interaction, will eventually allow us to experience unreality as reality – to experience a story, a game, a film or any other scripted device as reality. Our disbelief will be suspended to the extent that we cannot distinguish between reality and the virtual world. Documents will offer us truly immersive experiences. Immersive documents then, are the containers for a story, experience, fantasy, game, memory or idea, which allow the reader to perceive unreality as reality. As technology progresses, we creep closer and closer to the worlds portrayed in science fiction. The world of the holosuite for example. It is not however, merely the enabling technologies which carry us along on the quest for ever more believable stories. It is something also of human nature. The desire to suspend reality, the willingness to enter fully into the unreal world is popular. We, as readers or users of immersive documents, wish to participate in, or interact with the story, often in a way which allows us to influence the sequence of events or the final outcome. In unreality, we may be offered a level of control unimaginable in real life. The legacy of immersive documents undoubtedly stems from the pleasure of reading a good book. 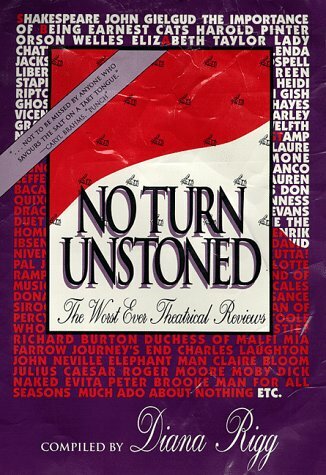 Before the spread of digital technologies some authors attempted to allow the reader a modicum of interactivity – to choose an ending to the story, either by selecting from pre-written options, or by voting by post. As technology advanced, more realistic interaction has been supported by interactive video or online gaming and by web 2.0 technologies leading to dynamic web pages and applications such as Second Life. In the cultural sector we witness the popularity of immersive exhibitions such as the recent David Bowie is shown at the V & A, immersive theatre, 3D cinema and the astonishing outpouring of content created by cultmedia fans, including simulated worlds and real-life cosplay. The possibilities here are endless, and immersive stories can move beyond fiction and entertainment to include teaching and learning in realistic, yet safe environments. There is a dark side too, though. The unreal world may be somewhere we prefer to stay. Whilst Neil Gaiman came to end of his excellent dark reading and we all went home, the immersive documents just around the corner may be harder to switch off. So, December 31st, and all the books lying on my attic floor are still there. They have progressively accumulated since last January, and whilst I have every good intention of promoting them to their ‘proper’ place on the shelves, they remain where I first put them, in little huddles on the floor. The reason they are still resident on the carpet, where the Bad Persians spitefully spike their corners, is that I have no more room on my shelves. I get older painlessly, endlessly absorbed with taking everything off one shelf, dusting, and believing that it will now be possible to squeeze more in than before. As I return the volumes I become distracted by something as I leaf through the pages, and time slips away as I engage with something I have owned for ages, but never focused on before. There is then the dilemma of whether a book should be in place A, with X Y and Z, or in place B with E F and G? Should my books on Lithuanian libraries stay alone in my attic with LIS related material, or should I unite them with their natural co-habitees of books on Lithuanian places, folk tales and cuisine (currently downstairs with travel, fiction and cookery respectively..)? Should my Ladybird book of ballet stay here with the other ladybird books or should I separate it from its same size siblings and put it downstairs with the other books on ballet? Maybe I should have two copies of these things..? No. Definitely no. There is no more room on my shelves. In his book ‘The Library at Night’, Alberto Manguel devotes a whole chapter to ordering (The library as order). His dilemma in arranging his collection offers me some solace. … to place them by size so that each shelf contained only volumes of the same height. … sometimes this order would not satisfy me and I’d reorganize my books by subject: fairy tales on one shelf, adventure stories on another, scientific and travel volumes on a third, poetry on a fourth, biographies on a fifth. And sometimes, just for the sake of change, I would group my books by language, or by colour, or according to my degree of fondness for them. Once a category is established, it suggests or imposes others, so that no cataloguing method, whether on shelf or on paper, is ever closed unto itself. Why stash the works of Saint Agustine in the Christinianity section rather than under Literature in Latin or Early Medieval Civilizations? Why place Carlyle’s French Revolution in Literature in English rather than in European History, and not Simon Schama’s Citizens? Why keep Louis Ginzberg’s seven volumes of Legends of the Jews under Judaism, but Joseph Gaer’s study on the Wandering Jew under Myths? Why place Anne Carson’s translations of Sappho under Carson but Arthur Golding’s Metamorphoses under Ovid? Why keep my two pocket volumes of Chapman’s Homer under Keats? Ultimately, every organization is arbitrary. Then there is LibraryThing – and the need to not only to add in all my books (scanning in the covers for the more ancient or foreign ones), but to devise a scheme to tag them all according to where they are on the shelves, and consequently to which category I feel they should belong. Although any electronic catalogue allows for the possibility of placing an item in more than one category by adding multiple tags, this does not help in my quest to create the ideal collection, in the ideal order, with all the books on the shelves. And sadly, on the topic of social networks for books, Alberto Manguel is silent. But, dear reader, there is more to this prose than the story of how I maintain a collection of books rather than just a stash beside my bed. The truth is I collect quite a lot of things. I mean collect them rather than just happen to give them space in my house, because they are obtained specifically in relation to the other things which I possess. They are organized. I organize them. Endlessly, never to my complete satisfaction, and occasionally (designer handbags) to facilitate gloating. And there is never enough space to present my collections on the shelves and in the cupboards, in the way in which I would like. I have been driven to contemplate my true nature as I read “An Infinity of Things: How Sir Henry Wellcome Collected the World”, written by Frances Larson, in which she investigates his compulsion to collect just about everything. Whilst the word ‘obsessive’ is not mentioned, the negative consequences of Wellcome’s desire to collect ‘everything’ are painful to read about. His marriage failed; his need to control not just the objects his buyers found, but any subsequent research ideas that ensued, caused significant friction between Wellcome and his employees, and perhaps most sadly of all, he collected too much. The process of collecting overshadowed the desire to learn from, or enjoy, the things collected. Most of his collection was in storage, destined to be partially dismantled after his death. … Wellcome ran out of time. The story that might have emerged from all his frantic collecting – the great history ‘of the art and science of healing’ that he intended to depict through his rarities – was never finished. The collection was never exhibited en masse, polished and consistent, as he intended it to be. Yet, perusing the fantastic legacy that is now the Wellcome Collection and Library, it is impossible to say anything other than that Henry Wellcome’s activity was worth it. So what about my collections? Well I don’t think I collect anything with a view to having everything. I think I first thought of this when attempting to compile a list of toxicology resources for my PhD – too many even a decade ago for the most ardent of resource collectors. My approach has evolved to aspire to a representative sample of what is available (e.g. LIS books, colored frock coats and SpaceNK products). After all, there is no more room on the shelves. And I doubt that anyone will consider my collections a legacy. But I do enjoy being organized and I naturally form collections from the things I have. I have to put like things together and take great pleasure in thinking of ways to do this. My great uncle’s bible and his stereoscope, for example, may seem unlikely shelf sharers, and yet I place them side by side in the cupboard because they are the only things of his that I posses, and so even though I have other bibles, this particular one sits alone on a box of cards intended to generate 3D images at the beginning of the 20th century. Sometimes I discover new things from arranging the old things. Recipes for example. All the cut out ideas from magazines and newspapers could so easily sit in a heap, good for nothing except artful clutter. Yet when organised according to savoury or sweet, and even crudely subcategorized, I find a pattern in the type of food I felt drawn to, and a renewed interest in cooking something nice to eat. And then who hasn’t enjoyed making playlists from all the CDs which lay forgotten in their rack, as soon as all the tracks are loaded onto iTunes – the software arranging the random pile of sound history into something new and attractive – hateful to those who admire the concept of an entire album, but smashing for those of us who only ever liked one track anyway. And the same for photos, and papers as well as books. What about all those old letters and postcards? Is there anything that cannot become a collection? Cleaning products, the contents of the fridge, knitting patterns, crockery … mmm I can see where Wellcome had a problem – its all so interesting, placing like things together, establishing differences, seeing what is missing, and what has previously passed unobserved. 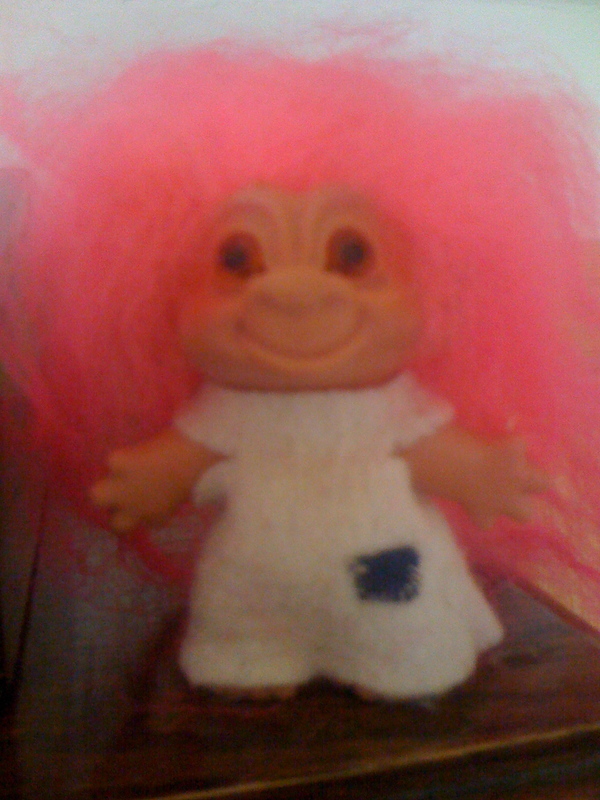 My earliest collection was one of books by Enid Blyton – and then when I was eight, I started to collect trolls (see Mimi above) – each named and dressed in clothes I designed and made myself. Easy to see where I came from. But it is December 31st , and so before another year passes, I am going to the fridge to find cheese and champagne – and yes … the cheeses are stored according to country of origin… but no – I don’t collect champagne – I drink it as soon as it is chilled. Happy New Year. Larson F (2009). An Infinity of Things: How Sir Henry Wellcome Collected the World. Oxford University Press: Oxford. Manguel A (2006). The Library at Night. Yale University Press: New Haven and London.